Stompers adopted their trademark game for this league encounter against a young Kavallieri side, quickly recycling possession with McLister at 10 dictating the width of the attacks. Kavallieri played with passion throughout but were frustrated by Stompers’ effective defensive cover. Richard Gum was all energy for Stompers until he went off just before half-time, having scored two tries and two conversions and two penalties to push the score to 25-0 nil on the half-hour mark, with a penalty try included. Gary Hili, Ryan Sullivan and the impressive Aidan Micallef were into everything for Stompers as Sean Doublesin tried hard to keep Kavallieri on attack with some fine-touch finders and running skills. Jeremy Debattista, out on the wing, seemed lost but then unleashed a powerful run up the middle. His final pass went to ground but from the ensuing play a penalty try was awarded by the referee. A box-kick by Max Galea over his forwards had the Kavallieri back three in all sorts of bother. Gum swooped on a dropped ball and ran it 30 metres to score in the corner. 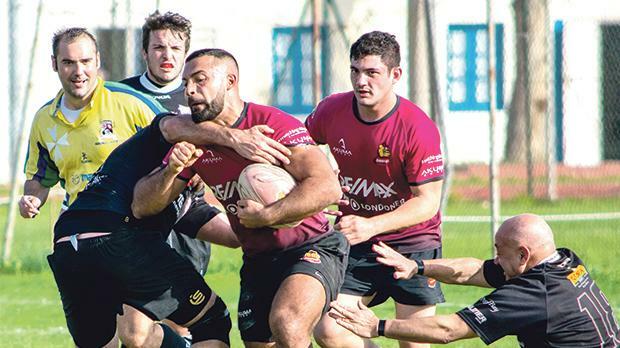 Malcolm Attard came on for Gum and his contribution was rewarded with a try after a Luke Debattista 80-metre run to under the shadows of the Kavallieri posts. At half-time, Stompers led 32-0. Coach Dan Moore urged his Kavallieri players to tighten it up in the forwards and play territory. They did that for five minutes and scored with a bullocking run by Graham Attard from a quick tap penalty by Joseph Cutajar after a weaving run upfield by Fajak-Hanan. Kavallieri’s hopes, however, soon faded as Stompers moved up a gear and McLister powered a penalty kick over from the half-way, to keep the scoreboard ticking. He then scored in the corner following a Debattista run down the touchline, stepping back infield and linking with his inside backs. Kavallieri were giving their all but their individual breaks were fizzling out due to a lack of support runners or poor passes. Attard had a weaving run out from his 22. He offloaded to Camilleri who released Azzopardi on the wing and the latter ran it in to score. With McLister adding the conversion, Stompers increased their lead to 50-5. Betts ran a straight line down the middle to score another try and McLister converted. Fresh legs for Kavallieri didn’t help their cause as Stompers scored again through Galea as Attard went on to seal the win late on. Best players: The entire Stompers team and Sean Doublesin (Kavallieri).